Rare pictorial map of Jamestown, Rhode Island illustrating the regional events of the American Revolutionary War. Ye Olde Map of James Towne or Quononoqutt Island. A rare example of a rare 1928 S.C. King Jr. map of colonial Jamestown, Rhode Island. 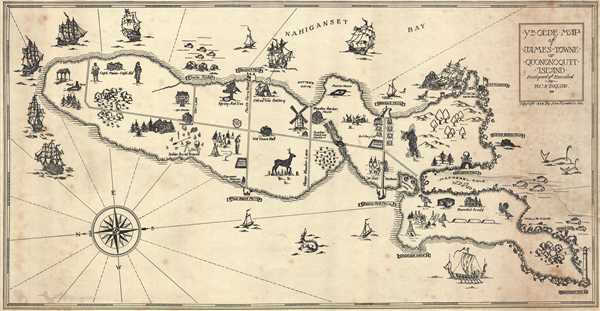 The map depicts Conanicut (Quononoqutt) Island where the settlement of Jamestown was established in 1678, named after James, Duke of York, who would later become King James II. Certain sites, such as Eldred's Gun Battery, Fort Dumpling, and the 'British' and 'Yankee' soldiers suggest that this map depicts Jamestown during the American Revolution. Eldred's Gun Battery, for example, refers to John Eldred, who placed a cannon between two large stones on his property overlooking the East Passage of Narragansett Bay and fired on passing British vessels. Both Eldred's Battery and Fort Dumpling were destroyed by the British when they occupied the island. Other buildings, such as the windmill and the Quaker Meeting House, which were important to the community, and were also destroyed by the British and subsequently rebuilt. Several naval vessels can be observed in Narragansett (Nahiganset) Bay, one of which has run aground near Fort Dumpling. Schools of fish around the island, and a pair of whales near the right border, underscore the region's rich fisheries. The Conanicut Island Lighthouse is included in the lower right corner. We have been able to locate but a single example of this map in an institutional collection, that of the Jamestown Historical Society. This map was designed and drawn by S.C. King Jr. and published by the John F. Greene Co. Inc. of Providence, Rhode Island, in 1928. Good. Backed on archival tissue. Repaired tear reaching 8.5 inches into printed area from right margin. Scattered foxing. Even overall toning.